It might be hard to believe today but there was a time in Tamil Nadu when men wanting to marry had to win the trust of the girl’s family by either controlling a charging bull or lifting a heavy boulder. And since the task demanded a high dose of instant energy, the girl’s family would feed the aspiring son-in-law a red rice variety called mapilai samba, which means son-in-law rice, before the feat. The tradition went out of fashion with time. And so did the healthy rice variety. Mapilai samba is one of the many varieties of red and black medicinal rice in Tamil Nadu that are hardly grown today because of the commercial demand for polished white rice. What is worse, many nutritionists call the polished rice varieties empty source of calories that are best avoided. As a result, rice consumption in the state has witnessed a steady drop despite the availability of several healthier options. According to the recent National Sample Survey Office data, per capita rice consumption in Tamil Nadu is falling annually by 0.69 per cent and 0.39 per cent in urban and rural areas respectively. Now some farmer groups near Chennai are trying to revive these indigenous rice varieties. They are growing karunguravai, kavuni, mapilai samba and kullakar varieties, each known for its unique health value, taste and cooking techniques. T Thirunarayanan of Chennai non-profit Centre for Traditional Medicine and Research says there are surprising parallels between what Siddha medicinal tradition of South India, one of the oldest medicinal traditions known to humankind, has to say about these rice varieties and the findings of modern science. Karunguravai, a thick, short-grain, red rice variety that has to be soaked for 24 hours before cooking, has 19 mg of iron per 100 gm—four times the iron quantity in other red rice varieties. “Siddha recommends the rice for patients suffering from anaemia, weakness, malnutrition and excessive fluid retention in conditions such as anasarca—all caused by iron deficiency,” says Thirunarayanan. Karunguravai is another red rice variety used in Siddha medicine to prepare rice vinegar that works as a medium to administer inorganic medicines made from mineral ores. Mapilai samba, a red variety that has slightly longer grains than karunguravai, is high on carbohydrate and low on glycemic index. “Its fibre content is higher than the other rice varieties. This ensures there is no spike in blood sugar after a meal, but sustained sugar release keeps energy levels stable for long after consumption,” says Thirunarayanan. 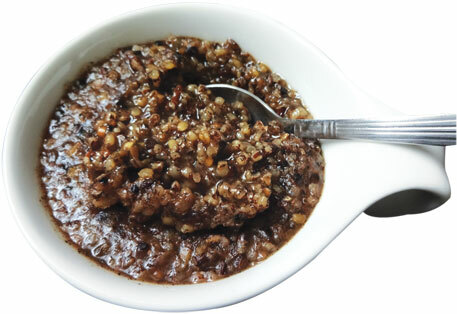 Kavuni, a medium-grain, black rice, believed to have originated in Myanmar, Indonesia or Malaysia, is used by the Chettiar community of Tamil Nadu to prepare chakkarapongal—a rice and jaggery dish made on festive occasions. “Its glycemic index is so low that even its sweet dish does not cause blood sugar to spike. It is good for diabetes,” says Thirunarayanan. Traditionally, it is given to pregnant women for strength and to ensure a painless delivery, says Ravi who comes from a farmer family and works at the organic store Restore in Chennai that sells red and black rice varieties. Kullakar, another red, short-grain variety, is rich in fiber, calcium and magnesium. Siddha texts say it is good for patients who urinate excessively or have urine tract infections. “Our research indicates that it is also good for diabetics, and the high nutrient content raises immunity against infections in general,” says Thirunarayanan. Sangeetha Sriram, who owns Restore, says the demand for these rice varieties is high among health-conscious groups, and they fetch prices ranging from Rs 65 to Rs 120 a kg. “However, in the open market there is hardly any demand because of low awareness,” says Sriram. One of the reasons for their low acceptability is that they take almost twice the time required to cook the polished varieties. They also need to be soaked for at least a couple of hours before they can be cooked. Farmer groups are now trying to develop products such as rice rawa (semolina like coarse rice powder) which can be cooked faster and consumed as snacks, to enhance acceptability. More can be done in conserving and propagating these rice varieties with the support from government agencies. For instance, the government can introduce healthy rice varieties in its welfare schemes such as Integrated Child Development Services. This will create the demand that will incentivise the growing of such rice varieties. “At present, rice is no longer profitable for farmers because even village people are shifting to wheat. Supporting these rice varieties can help both farmers and consumers,” says Thirunarayanan. Wash and soak the rice for 24 hours. Cook it the usual way but remember that it will take longer to cook than the polished white rice. It takes about half an hour to get cooked in a vessel, and needs at least five whistles in a pressure cooker. Wash and soak Kavuni rice for two to three hours. Roast the moong dal in a pan to make it crisp. Add the soaked and drained rice, and mix well. Roast the mixture for a few minutes. Add water and cook till the rice and dal get blended into a semi-dry mixture. This should take around half an hour in a covered pan. Meanwhile, prepare thick syrup by boiling jaggery and water. After the ricedal mixture is ready, add the syrup, and simmer on a low flame till the mixture acquires a thick consistency. Optionally, add a crushed cardamom while boiling. Add a little ghee, and continue stirring for a few minutes more. Take off flame. Serve with a topping of ghee and dry fruits.